St Mary's Dalmahoy is a beautiful little church standing close to the entrance to the grounds of Dalmahoy House, now the Dalmahoy Hotel & Country Club. Only a hundred yards or so from the main A71 and less than three miles from the Edinburgh City Bypass, as you stand in the tranquil churchyard you could be forgiven for thinking you were very much further than seven miles from the centre of Edinburgh. 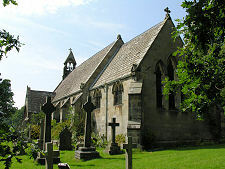 St Mary's Dalmahoy is part of the Scottish Episcopal Church, a member of the world-wide Anglican Communion which traces its history back to St Columba and the early days of Christianity in Scotland. 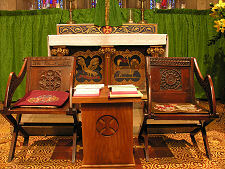 Like its sister-church south of the border, the Church of England, the Scottish Episcopal Church is governed by Bishops. This is one of the things that distinguishes it from the much larger Church of Scotland, a Presbyterian Church governed by representatives of the congregation. This may not initially sound like a major difference, but it was King Charles I's efforts to impose government by Bishops on the Presbyterian Church of Scotland which led to a riot in St Giles' Cathedral in Edinburgh on Sunday 23 July 1637. This in turn led directly to the Bishops' Wars; the Wars of the Covenant; the English Civil War; the execution of Charles I; and Cromwell's occupation of Scotland: 23 years of wide-ranging conflict that did not really end until the restoration of Charles II in 1660. Those days are, thankfully, long gone, but it helps to know that differences of opinion about church governance were once, quite literally, a matter of life and death. St Mary's Dalmahoy was established by the then residents of Dalmahoy House, Lord and Lady Aberdour, in 1850. 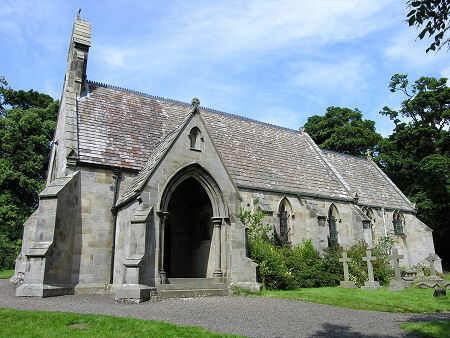 Land was granted by Lord Aberdour's father, George Sholto Douglas, the 17th Earl of Morton, for a church and a burial ground, as well as for a rectory, a schoolroom, a schoolmaster's house and a choir house. The church was designed by the architect John Henderson, and consecrated at a service led by the Bishop of Edinburgh on 24 September 1850. Although standing on the private Dalmahoy Estate, the church was, from the beginning, intended to be part of the wider Episcopal Church in Scotland and used for public worship. 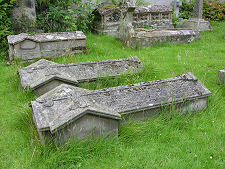 In contrast, the burial ground, initially at least, was for family use only. To understand why the Douglas family built St Mary's you need look no further than an account of the (Church of Scotland) Ratho Parish written in 1845. This noted that 17 Episcopalians lived in the parish, most of whom were members of the family of the Earl of Morton. 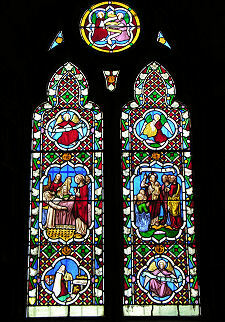 Two of the Earl's five sons entered the Anglican priesthood, one of whom became the Bishop of Aberdeen and Orkney in 1883. St Mary's was therefore built to allow the Douglas family, and other Episcopalians in the area, to worship according to their conscience. 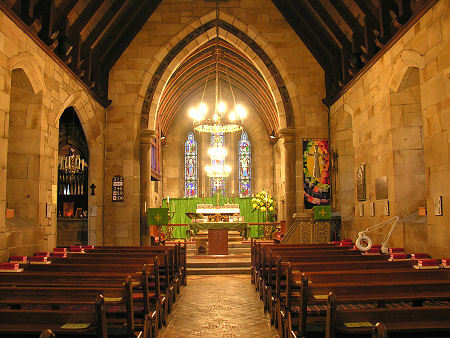 Although Ratho Parish itself had few other Episcopalians, it was estimated in the mid 1800s that three quarters of the "landed proprietors of Scotland" were Episcopalians (a by-product of so many sons being educated at English public schools): so there were likely to be a number of people in the wider area keen to worship at St Mary's and with the means to get there. St Mary's Dalmahoy has changed little since it was built in 1850, though improvements were made to things like the heating in 1883. It was perhaps at this time that the organ was installed, probably being moved here from Dalmahoy House. The structure of the church itself has not been greatly altered during its life. 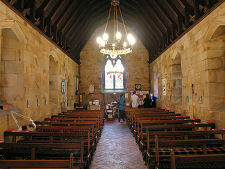 Internally it comprises a nave with a chancel at the east end. The plain stonework, deep window recesses, narrow windows and chancel arch all combine to give a sense of a very much older church. The detail may not quite be right for the period, but the church has a feel that is almost medieval, and a charm that is ageless. 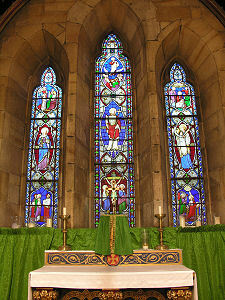 The lovely atmosphere of the interior is enhanced by a complete set of stained glass windows. Some of these date back to when the church was built. Others are much more recent additions. 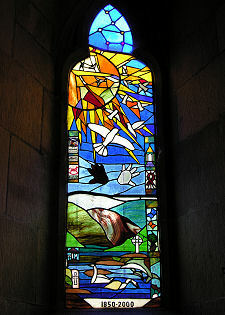 These include the Millennium Window made by members of the congregation to celebrate the sesqui-centenary (150th anniversary) of the church and the Millennium it coincided with. If St Mary's itself is much as it was in 1850, the same cannot be said of the Dalmahoy Estate it still stands on. Dalmahoy House fell out of regular use as a family home in 1907, and in 1928 the house and some of the park was let to the Dalmahoy Golf Club. In 1990, Dalmahoy House was converted (and greatly expanded) into a luxury hotel, golf and country club. This brings a steady stream of visitors to St Mary's. 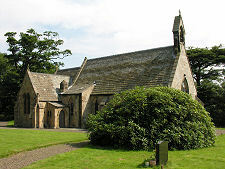 It has also led to St Mary's Dalmahoy becoming a highly favoured venue for weddings: the combination of a beautiful little church in which to conduct the ceremony and a luxury hotel in which to hold the reception is a highly attractive one. And for anyone fond of a mystery, the churchyard is home to an enigmatic stone cross slab. This has a number of features found on stones made in Iona and might date back over a thousand years, but no-one really knows. 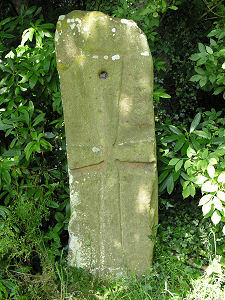 It is believed to have stood in a field about a mile west of St Mary's, and carries a hole suggesting it was once used as a gatepost. 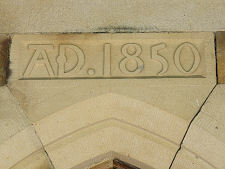 It seems to have been rescued by the rector in the 1930s or 1940s and relocated to its current home to the north east of the church.